Have you ever bumped into Fernando Torres shopping in Liverpool or Wayne Rooney milling about in Manchester? Get a photo with them by any chance? In a throwback to swapping cards of your favourite players in the playground, BBC Sport needs your pictures to complete our World Cup Photo Album. Your pictures with the stars of South Africa 2010 will be used to complete squads, including the head coaches for every nation taking part. From Algeria to Uruguay, the challenge is to fill the gaps and complete the album! 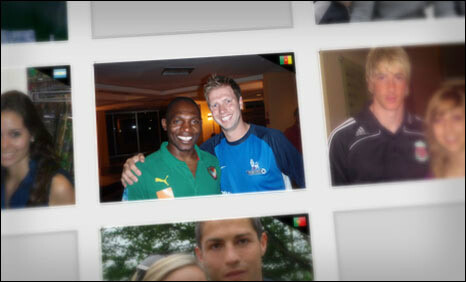 You can view each country's fan photos through the drop-down link on the top right of this page. Don't forget to send us as much detail as possible and we will include it in the album. Email your fan photos to worldcupphotoalbum@bbc.co.uk, or via Flickr and keep an eye out for our page on Twitter throughout the tournament. If you have old pics of you rubbing shoulders with Pele or have memorabilia connected with World Cup legends of the past, please send those to mybbc@bbc.co.uk or visit the World Service website . If you haven't been fortunate enough to bump into a World Cup star yet, perhaps you can take part in the World Class school project! Forward your photo of your school football team with a mascot representing your school's favourite team in the World Cup to worldclass@bbc.co.uk. The best from each supporting nation will be featured in the World Cup Photo Album!